Arthritis pain makes it hard to get enough exercise. Your parents want to be active, but ankle, knee, hip, and wrist pain keep them from meeting their goals. Have you considered moving their fitness activities to a pool? In the water, you’re more buoyant. This eases pressure on the joints impacted by arthritis. If your parents have a pool at home, they won’t have to pay anything or sign up for a class in order to work out in the water. What if your parents don’t have a pool? 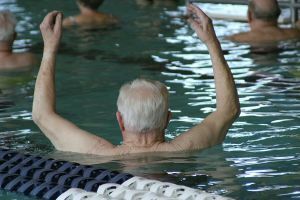 You may find fitness classes for seniors at places like the local Y or community pools. With the soft-sided pools that are affordable and easy to find in stores, your parents can put in a small pool when the weather is ideal for swimming. This enables them to work out regularly. Once they have access to a pool, here are some activities that help them stay in shape. In a round pool, your parents can walk laps around inside of the pool. The water creates a bit of resistance to make it more of a workout. The longer they walk, the higher the odds that they’ll create a whirlpool. Once they have, they should turn around and try to walk against the current. The force of the circling water will make them really have to work the muscles in the legs. As the whirlpool slows down and eventually stops, they can start over. If the pool is large enough, your parents can get a thorough workout swimming laps from one side of the pool to the other. If it’s not possible to swim laps, they can hold the rim of the pool and kick their legs as though they are swimming. This will also work out the legs and hips. Zumba classes are moving into the water and becoming very popular. Put on some music in the yard and let your parent dance in the pool. Moving the arms, legs, hips, and shoulders ensures a comprehensive workout of the entire body. Do your parents need supervision when they’re outside? Do they need a ride to a community pool? Home care services provide transportation, reminders to put on sunscreen, and monitor time spent in the sun. Home care service providers can also help your parent cook, clean, and manage household duties. Call our home care services agency to learn more about these and other services. For Home Care Services in Covington TN, please contact the caring staff at Personal Care Services MidSouth today! This entry was posted in Exercise, Home Care Services Covington TN and tagged Home Care Services Covington TN. Bookmark the permalink.